Depicting the lives of an estranged couple, who, for the sake of their children, come together on several occasions, the show Itna Karo Na Mujhe Pyaar portrays how although the love and relationship between them may change, the love they hold for their children can never diminish. The main protagonists Dr Neil Khanna, played by Ronit Roy, and Dr Ragini Neil Khanna, played by Pallavi Kulkarni, who have been living separately for over fifteen years, are finally meeting after fifteen years for their daughter’s wedding. 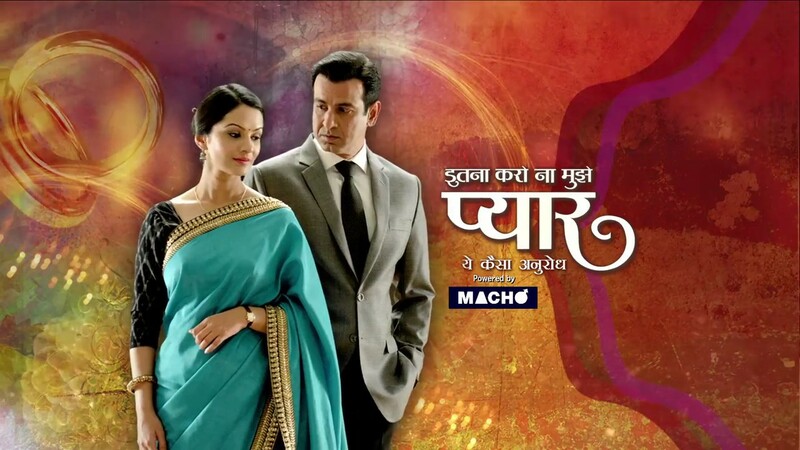 The show Itna Karo Na Mujhe Pyaar has taken quit a turn, though, with Neil and Ragini remarrying for the sake of their children. All the marriage ceremonies are done with, leaving Nivedita fuming. Nivedita still in love with Neil feels betrayed by Pam, since Pam was all up for Neil getting married to Ragini. Unbeknown to Pam, Nivedita managed to record Pam while she was explaining how marrying Ragini can give Neil back his job and hospital, which he was on the verge of losing. After the marriage rituals, Pam finds out that Sunny had given Neil and Ragini an aphrodisiac paan. She tries to stop them from eating the paan but is stopped by the children who are trying to give Ragini and Neil some privacy. Nivedita fumes over it and warns Pam that if they do eat the paan, she will go ahead and show the recording of Pam to the entire family, leaving Pam afraid of the outcome. Neil and Ragini feel the effects of the paan and they try their best to not give in, unaware of the real reason for them feeling this way. Neil manages to break the flower decorations and they start cleaning it up in good camaraderie. Once they decide to sleep, Ragni starts to snore and Neil is unable to sleep. Come morning, Ragini is ready after a bath and wakes Neil up where she comes to know that he hasn’t slept all night. They get ready and leave the room to go meet their children who would be up by now. The upcoming episode would show how the family reacts to the fact that Neil hasn’t slept all night by teasing him about what the reason could be. Dimpy comments how Ragini’s face is glowing and Agam talks about how he heard things breaking. The family is happy with the turn of events and we will, definitely, be seeing a lot more joy with the reunion of Ragini and Neil. You can also watch episodes online to know more about the upcoming twists. This entry was posted in TV shows online and tagged Itna Karo Na Mujhe Pyaar on September 14, 2015 by riyabhora.